Last week we saw Apple unveil the refreshed MacBook Pro range with the headline feature being the new Touch Bar, but rival Microsoft was working on the idea of context-sensitive keys during the last century – albeit only just. As The Verge spotted, back in 1999 Microsoft’s Applied Sciences Group was working on ‘adaptive hardware’ and produced a concept keyboard that “displays the active action keys and hides the irrelevant keys for a given application”. In other words, the idea was to intelligently switch keys depending on the app being used, and what the user was doing in that app, a la Apple’s new Touch Bar. After the initial concept was played around with some 17 years ago, various prototypes were worked on through the course of the 2000s, including morphing LED keys, and using a camera and projector system to project different types of key. And then in 2009, Microsoft produced an ‘adaptive keyboard’ which featured a “touch-sensitive display strip” along the top – far larger than the OLED strip on the new MacBook Pro – and in this case, the display continued underneath the keys, so the entire keyboard was dynamic (a bit like Apple’s rumored incoming e-ink Magic Keyboard). 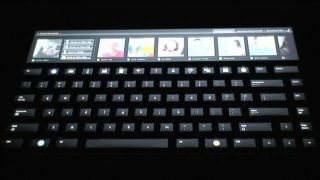 As the video below of Microsoft’s prototype adaptive keyboard illustrates using PowerPoint as an example, the touch strip could be used to navigate through your slide deck, and tap to insert a new slide. Then you could tap the function key with a picture of a chart on it to insert one of those, whereupon the entire keyboard changed to icons of different types of chart, allowing you to visually pick one out on the keyboard. Granted, this is nowhere near as cool as the Touch Bar and its slick integration with the MacBook Pro keyboard, but nonetheless it’s interesting to see that Microsoft picked up on the concept so early. Of course, it doesn’t look like Apple will be mulling the touchscreen route with the MacBook any time soon – if ever – particularly with the news that the aforementioned transforming e-ink keyboard is supposedly coming to Apple’s notebooks the year after next.